Mac OS X Lion doesn’t include a Java runtime environment on the default installation. However Apple has immediately released Java as a separate download. The download size is 62.53MB and installs Java SE version 1.6.0_26. Java for Mac OS X 10.6 Update 5 delivers improved compatibility, security, and reliability by updating Java SE 6 to 1.6.0_26. Please quit any web browsers and Java applications before installing this update. See http://support.apple.com/kb/HT4593 for more details about this update. Java for Mac OS X 10.6 Update 2 delivers improved compatibility, security, and reliability by updating Java SE 6 to 1.6.0_20. Update via the “Software Update…” on your Mac! Eclipse is an excellent IDE, however some of its preferences may not be that straight-forward. On one of my recent Java projects I had to work with a character encoding other than the default ANSI encoding. Thus, I managed to set up the database connection properly to use the required UTF-8 encoding, as well as handle the returned data correctly as UTF-8 in the Java code. When I tried to output some of the data, for logging purposes, in the console, the output couldn’t not be read correctly. The first thought was to double-check the source code, connection properties etc, and despite the fact that everything looked just fine, the console output still was unreadable. 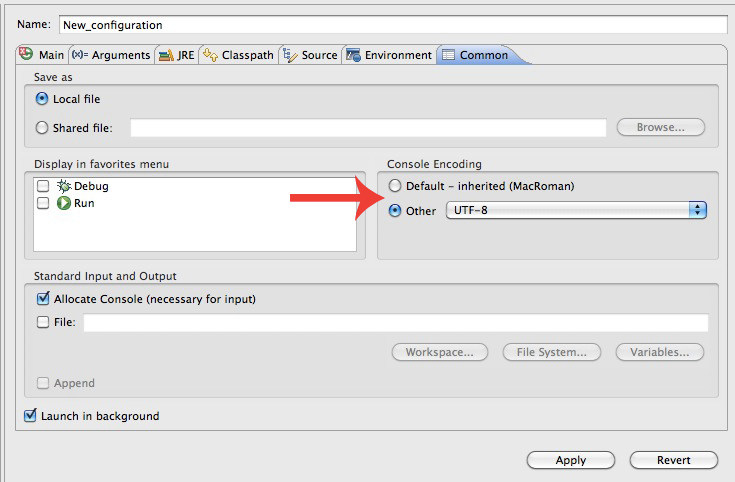 After spending some time trying to find a relevant option in Eclipse, I stumbled upon the “Common” tab in the Configurations panel. And indeed this is where I found the answer to the encoding problem! Create or select an existing configuration for your project, and switch to the “Common” tab. Choose you preferred Console Encoding as shown on the image above! Recently I had to setup a Java app on my Mac, which was running from the Terminal, and needed the JAVA_HOME variable set. – Start the Terminal app. Note: I first tried creating and using the ~/.bashrc file, but that didn’t work (Mac OS 10.6.2), while ~/.bash_profile worked as expected. … save and exit vi. If you see the correct JAVA path, then it is all done! Java for Mac OS X 10.6 Update 1 delivers improved compatibility, security, and reliability by updating Java SE 6 to 1.6.0_17. Please quit and relaunch any web browsers and Java applications after installing this update. This release is Windows 7 support-ready and includes support for Internet Explorer 8, Windows Server 2008 SP2, and Windows Vista SP2. New features include the G1 garbage collector, plus performance and security enhancements.